There are five different orchestras, meaning that players of all abilities have a great opportunity to have fun making music and new friends, whether they have been learning their instrument for just six months or are accomplished musicians who have been playing for several years. Participants enjoy between 1 and 4 days of orchestral playing, sectionals, chamber music and workshops. When and where does Yorchestra take place? Yorchestra courses are held during the school holidays at Easter, summer and Christmas. There are courses for all orchestras during the summer and Christmas sessions. The Easter session is for Yorchestra 3, Yorchestra 4 and Yorchestra Young Strings only. Yorchestras 1 and 2 take place at the University of York Music Department, with Yorchestras 3 and 4 and YoYoStrings usually taking place nearby, at Heslington Church. Yorchestra costs £50 per day if paying full fees. We believe this represents fantastic value for money, given the high quality of the course, but we also appreciate that some families face difficult financial circumstances. 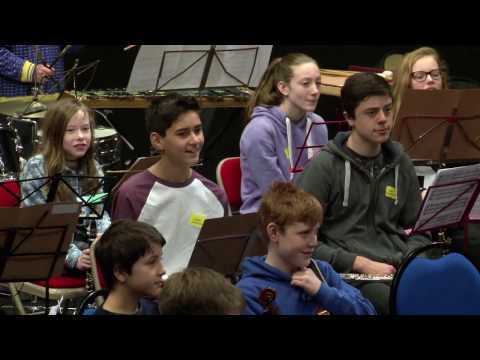 We are keen to ensure that as many young musicians as possible should be able to access what Yorchestra has to offer, and some assistance with course fees is available in the form of bursary funding for eligible applicants. For more information, please see our bursaries page. Extra funding now available for bursaries! See our news page for more details. 25% “first-time player” discount (for any player who is new to Yorchestra). See our discounts page for full details. Yorchestra is a registered charity, and is non-profitmaking. Simply complete the appropriate online application form for the orchestra you wish to apply for, and make payment for the relevant course fee (by bank transfer or cheque), before the closing date shown on this page. Online applications for bursary funding should be submitted at the same time. Applications are dealt with on a first-come, first-served basis, so we encourage all players to apply as early as possible. One of the amazing things about Yorchestra is the quantity and quality of our conductors and tutors, a fact reflected by the fact that 75% of our course fees are spent on tutor costs. We engage professional musicians, assisted by student tutors, to ensure that players of all instruments receive the expert and specific tuition that they need and deserve, enabling them to tackle a varied and challenging repertoire with confidence and enjoyment. What do others say about Yorchestra? For the very latest on Yorchestra, visit our news page!